So by now you've probably determined that I'm really into audio. As in, really serious about audio. Audio is a touchy subject because well, it's highly subjective. Everyone's ears are different, everyone's preferences are different, and the fact of the matter is, no two headphones or speakers are exactly the same. That's why this time around, instead of relying on what my brain tells me, I'm going to rely on scientific instruments to determine what should and shouldn't be on my list. A decade and a half ago, I was floored when I first listened to Aureal 3D. The company was revolutionary in terms of what it brought to the consumer market. Sound cards that used Aureal's chips were able to produce realistic and believable 3D positional sound from just two speakers sitting in front of you. The method? Head-related transfer functions, or HRTFs for short. HRTFs measure the way sound responds to your ear, its shapes and features, as well as your head dimensions. Applying these calculations to the output of speakers trick your brain because the sound it hears are mimicking what would otherwise by accurate responses to how sound behaves when they reach your ears, allowing your brain to identify location. As you may know, Aureal 3D is dead. Ossic VR's final design of its amazing Ossic X 3D HRTF headphones. But Ossic VR is bringing back HRTFs in the form of headphones that automatically calibrate to your head and ears. With custom calibration, you're not limited to a one-size-fits-all HRTF model. I was lucky enough to be able to try Ossic VR's prototype in its lab just recently and was blown away by how realistic things sound. I could pinpoint any sound in true 3D space, and I reacted naturally to where I heard things. I want an Ossic X headphone, and I want one today. What would the Ossic X do for me that I couldn't do now? Stereo headphones don't have "imaging," period. Real imaging is only achieved by speakers that are placed appropriately and are in front or surround you. Headphones have drivers that sit directly facing your ears, so you get sound that exists in your cranium. That's not real imaging, no matter what the stereo headphone guys say. I was so impressed with the demo I heard on the Ossic X that I started wondering if the sounds that were realistically modeled with true HRTFs were what they would actually sound like if I was standing in the environment where they were recorded. A pair of headphones may sound "good" but is it what you hear? No one listens to a guitarist play his instrument with their heads placed next to the strings, which is where the recording microphone would be. But that doesn't take into account the actual listening environment. I want to hear things as though I were present. The bottom line is, I never felt more present than I did wearing the Ossic X. It took the VR experience I know to a whole new level of immersion—true immersion. What in the world is the HP 3325A? It's a tone generator. It creates sine waves, square waves, saw waves, etc. You choose the frequency, it creates a tone. This thing was built to last. It'll probably outlive me. The HP 3325A is also old. It's practically a relic. But it works and it works really well. It generates a pure tone with little to no distortion and it was build to last. The thing is made like a tank, and you literally can't find anything like it today. In fact, the buttons are mechanical and clunk hard when you push on them, delivering a sense of quality and physical satisfaction. Think of it like typing on a membrane keyboard and then switching to a Cherry MX mechanical keyboard. So, what can the HP 3325A do for me that I can't do now? Since it's so old, I actually don't have to lust for one, technically. You can find them on eBay for a bit more than they cost to ship. I'm starting to do a lot of serious audio testing, and the HP 3325A would be very cool to have. I could generate tones using software, such as the very popular NCH Tone Generator, and there are online generators available as well. But generating a good pure tone isn't easy. Plugging the output into an oscilloscope will show you what's really happening. The HP 3325A is built well, and doesn't require a PC. It's reliable, and you can count on it to perform well because that's all it was designed to do. This one's a bit of a stretch, but it's a true dream machine. The R&S UPV audio analyzer has everything a professional audio engineer needs. Scope, spectrum analyzer, phase and impulse response, single-ended and differential balanced inputs, etc.—the UPV's got it all and more. The UPV is the replacement for the UPL, which is expensive. A used UPL can be had for $10,000 and a brand-new UPV goes for over $40,000—yeah, that isn't a typo. But the UPV is state-of-the-art. It's incredibly accurate, clean, and versatile. In fact, the UPV is so stable in its measurements that you don't have to recalibrate it for over two full years. What you see above is the full Rohde & Schwarz analyzer and testing system paired with a Bruel & Kjaer Type 412BC HATS (head and torso simulator). With the software package from Listen Inc. called Soundcheck—used by manufacturers and engineers—the cost of this setup comes to a mind-numbing $100,000. 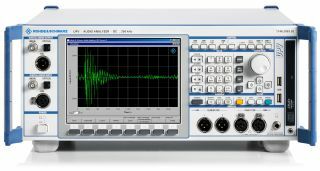 So, what could I do with the Rohde & Schwarz UPV that I can't do now? It would allow me to test things with incredible accuracy. I could do it all from the interface, without worrying about the PC adding any delays. Of course, you can overcome this with ASIO-enabled testing software such as Soundcheck. But seriously, just look at that thing. It's drool-worthy. In reality, I've been upgrading my testing platform all along to do headphone and speaker tests. How does it look right now? Wait until you see my next installment. If you're interested in how it's coming along, check out my guide on upgrading your PC audio experience.